Wellman played hockey during his time at Cranbrook, winning state titles in 2004 and 2006. He then attended the University of Massachusetts Amherst for two years where he played on the UMass Minutemen ice hockey team. He was signed to a two-year entry level contract on March 16, 2010, as a college free-agent. On February 3, 2012, Wellman was traded to the New York Rangers for center Erik Christensen and a conditional 7th round draft pick in 2013. He spent the remainder of the 2011–12 season with the Whale, but after Connecticut was eliminated from the AHL playoffs, Wellman was added to the Rangers' playoff roster. On July 20, 2012, Wellman was traded to the Florida Panthers in exchange for a 2014 5th round draft pick. He started the 2012–13 season with AHL affiliate, the San Antonio Rampage before he was traded by the Panthers to the Washington Capitals in exchange for forward Zach Hamill on January 31, 2013. Wellman was called up to the Capitals on December 17, 2013. He was reassigned to the AHL Hershey Bears on December 23, 2013. 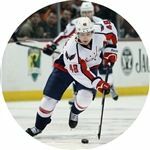 He was recalled a second time to the Washington Capitals on January 24, 2014 in time to play with the Capitals as they faced Montreal. Wellman scored a goal off of an assist from Capitals captain Alex Ovechkin in the second period and helped the team end a seven-game losing streak. On June 4, 2015, HC Spartak Moscow of the KHL announced that it has signed Wellman. He saw the ice in 40 games, tallying eight goals and eight assists for Spartak. Upon the conclusion of the 2015-16 season, Wellman moved on to Sweden, penning a one-year deal with SHL side Frölunda HC on May 30, 2016.